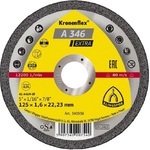 New cut-off wheel A 346 Extra Kronenflex has longer lifetime and has a greater versatility compared to A 46 Extra. Changed the composition of the grain, it has become much "cleaner". Model 346 Extra Kronenflex will be made with a diameter 115 and 125 mm. Thickness 1.6 mm.